Be entertained wherever you go, with the Red Portable DVD Player. 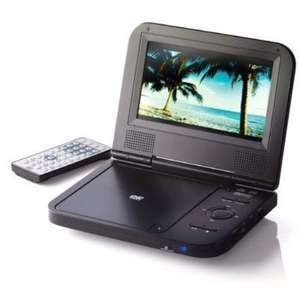 Ideal for keeping the kids entertained on a journey, or for beating the holiday blues when you're away from home, this portable DVD player has a built-in rechargeable battery and speakers. It will play DVD, DVD+/-R, RW, SVCD, CD, and JPEG disc formats. Included in the box is an AC/DC adaptor and remote control. Saw stock of this in Swansea store yesterday. Does anyone know if this has AV-in ? so anyone know what the actual screen size of this thing is? Thanks OP! Just the job to keep my little ones entertained on the plane! Good price - think they are 7" screens. £34.99 -cant go wrong heat ! may have to invest in this for a long flight to Oz ! Is there a free delivery code? Can anyone tell me how long these last after being charged? Thanks OP. I have been looking for portable DVD player for my daughter. anyone know if these will play divx off a DVD? I looked at the instruction manual instore, it did not mention divx. Shame its not 10", but nonetheless a good deal. Hot! Update. It does play divx, just got mine home and tried. None in Sainsburys on the forge retail park, Telford, if anyone was going there for one. Saw this on my mobile on the way there so thought i'd have a look if it was instore. Looks like a great price, might order one - i have a horrible track record for these portable dvd players, every one of them seems to just up and break. Its not like i'm even throwing them about lol. Is it possible to buy an adapter for this so that it will work in the car? well we have had that fit all of ours-we got them from ebay..but one of them came with it i think.. It comes with a car adaptor. I've ordered 2. got my staff discount too so only £31.50 each! Couldn't get any of the voucher codes to work though. We bought a double set of these on fleabay couple years ago for about £70, ripped off cos they didnt work - had to faff strapping seperate screens to back of front seats etc too, so these should be good (earphones can be used too- bit of peace in the front!). ace. I had wanted to buy one of these for my grandchildren but was unable to register all because I don't have a mobile 'phone what was wrong with my using my home number? Is the charge on these things definatley only 2 hours ? I have ordered some but now worried that the charge wont be enough !.. None in Plymouth Marsh Mills store. I had wanted to buy one of these for my grandchildren but was unable to … I had wanted to buy one of these for my grandchildren but was unable to register all because I don't have a mobile 'phone what was wrong with my using my home number?